Straightforward solution that can be easily integrated with existing operations. Reduces operational costs to clean a cubic meter of sediment laden water. Reduces costs for disposal of end water. In natural creeks and man made ditches to remove suspended and dissolved materials / metals. In constructed baffle grids, with rock checks, rock baffles, sandbags or standard construction materials. In ponds when used together with appropriate mixing devices such as aeration or fountain equipment. Used in combination with a geo-jute for sediment collection. ClearFlow ™ Water Lynx blocks provide a convenient method to introduce environmentally safe treatment into continuous or intermittent concentrated flows such as ditches, inlets, storm drain systems and pump discharges. Water Lynx blocks by Clearflow are a very convenient way of applying environmentally-friendly treatment into continuous or intermittent concentrated flows such as ditches, inlets, storm drain systems and pump discharges. 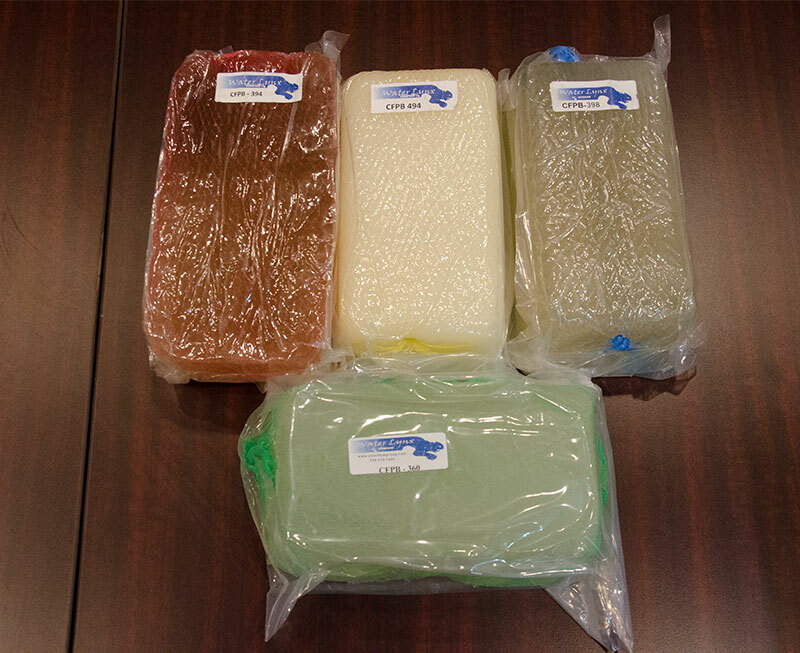 The blocks are semi-soft and wrapped in a plastic netting, enclosed by a vacuum bag. They have different colors which indicate their composition. One Water Lynx block will typically treat about 20,000 m3 of sediment laden water. Typical design configurations are calculated using 1 Water Lynx Block for every 50 to 100 gpm of flow.